And all the way to Z, which is for zygoptera. Beautiful art and enlightening text make this coastal primer a delight for children of all ages. ONE LETTER AT A TIME, accompanied by beautiful hand-colored linoleum block prints, we are introduced to one of the most interesting ecosystems on the planet. O is for Oystercatcher  A Book of Seaside ABCs is a tantalizing introduction to coastal life in a format that is a pleasure to read and impossible to outgrow. This seashore natural history primer is designed to please children as well as adults. While "A-B-C" books, or primers, are usually considered only for children, O is for Oystercatcher is enlightening for all ages. With beautifully reproduced artwork, this hardbound book is likely to appear on coffee tables in beach homes as well as next to a child’s bed. Barbara Patrizzi’s affection for the coast is apparent in her graphically beautiful depiction of coastal species. Each image in this book is from an original relief print made from a linoleum block. Relief printmaking is probably the oldest of all printmaking techniques: a design is carved into the surface of a material, ink is applied to the remaining raised areas and paper is then pressed against the inked surface. The black part of the resulting image was the raised (inked) area on the block. For this book, the uninked white areas on the print were hand-colored using polychrome pencils. Each page of artwork faces a catchy, cleverly written and informative natural history vignette. The key species in this book  many threatened by development and loss of habitat  depend on the health of the coastal ecology for survival; this book gently helps bring about an understanding of seashore life as well as sensitivity to the most serious issues facing the coast. "Pretty and useful" is a line from the text describing Irish Moss, but it also describes this lovely book itself. From limpet to zygoptera, albacore to monarch, this book’s appeal is both timely and aesthetic. The main point of the book is to show the successes, the challenges, and the absolute necessity of maintaining a healthy wetlands ecosystem," says Somers Point author/artist Barbara Patrizzi. 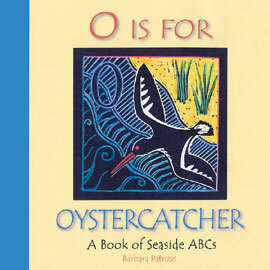 Her first book, O Is For Oystercatcher: A Book of Seaside ABCs was recently published by Down the Shore Publishing and is available at local and national bookstores. With gorgeous hand colored block prints for children to enjoy, and entertaining and informative corresponding text for adults, this 53-page book allows people of all ages to discover what's special about the creatures living on NJ's coast. Patrizzi says the entire family can share the book. "I think anyone interested in the wetlands could learn something from the book and enjoy the images." 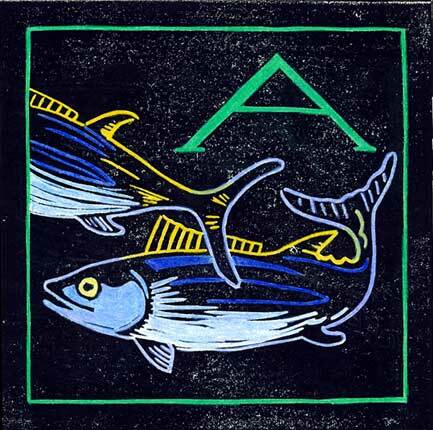 By the way, A is for albacore . Barbara Patrizzi grew up in southern New Jersey. She received her BFA from University of the Arts (then Philadelphia College of Art) in Philadelphia, PA, in 1981. She has exhibited nationally, and her paintings and sculpture are held in private collections throughout the country. She currently resides in Philadelphia and Somers Point, NJ, where she lives with her partner and various four-legged friends, and keeps busy swimming, kayaking and gardening. This is her first book. Copyright © 2004 Down The Shore Publishing Corp. The words "Down The Shore" and logo are a registered U.S. Trademark.